SINGAPORE, April 16, 2019 /EINPresswire.com/ -- Switcheo is proud to announce a strategic partnership with Obolus - a research and development company that provides solutions in the finance and blockchain sectors. 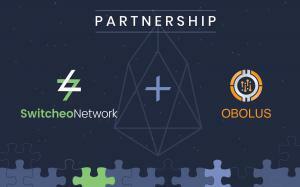 This partnership will enable Switcheo users to trade on the EOS blockchain on Switcheo Exchange. Switcheo's vision has always been to provide an easy-to-use trading experience without compromising on security, where users can be confident that all funds are always within their control. By leveraging an efficient on-chain matching engine designed by Obolus, the exchange allows users to trade in a fully trustless, fair and transparent manner. This technology is unique compared to other EOS DEXs which typically use less secure key delegation technologies. To easily onboard new users, the new EOS DEX is launched with a proprietary staking system, which pays the network fees for the users while they interact with the exchange contract. This first-of-its-kind system will allow users to trade on Switcheo without staking their own EOS tokens. Users unfamiliar with the EOS ecosystem can also create a Switcheo Account, where they will be able to trade on all chains without requiring separate wallet and software for each of the blockchains. Headquartered in Japan, the core Obolus team are former scientists with PhDs in mathematics, physics, and computer science. The team met while working for SBI, the largest online broker in Japan, where for two years they ran the algorithm trading desk for capital markets. Last year, the team established the trading desk of SBI's centralized cryptocurrency exchange in Japan. Since November last year, Obolus started developing their own decentralized exchange technology using the paradigms of the financial systems. Obolus has a strong background in finance and algorithmic trading. For years the team traded with direct market access, which allows them to design a market in competition to first-grade exchanges in the world. Japan is at the frontier of crypto regulation and innovation, and being in Japan allows them to foresee the market in the next couple of years from a vantage point. The interactions with the Japanese market taught Obolus how institutions and investors want to be involved with crypto; they want a solution that is secure, affordable, and easy-to-use. Switcheo Network is the first decentralized exchange on the NEO blockchain which now allows trading of Ethereum, NEO and soon EOS tokens. Our goal is to achieve a DEX network with cross-chain swapping capabilities across popular blockchains, with a focus on delivering a world-class trading experience in a trustless and decentralized environment. To find out more about Switcheo, visit our website.